Looking for the perfect gift? Or for a beautiful piece of jewellery to spoil yourself with? 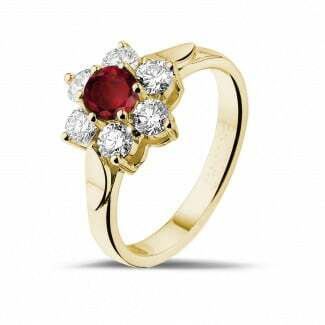 Choose a fantastic gold ruby ring here. The beautiful red colour isn’t just a traditional symbol of love, but it also exudes passion and strength. Allow yourself to be seduced by our unique collection and choose your favourite one. 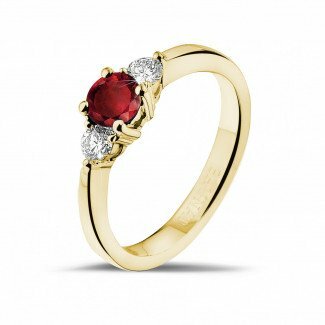 Why buy a gold ruby ring? There are plenty of gemstones, in addition to diamonds, which have always had a major symbolic value, in addition to the financial value. This is no different where the ruby is concerned. Its intense red colour means the ruby is often associated with love, passion, power and fighting spirit. Do you wish someone all of this? Then give her a gold ruby ring! Did you know the ruby is the birth stone for the month of July? A gold ruby ring is therefore a top present for someone who celebrates their birthday in July. Plus a coloured gemstone is always more favourably priced than a coloured diamond. Which rings are included in this collection? We can provide you with a gold ruby ring in white gold, yellow gold and red gold. Even though a red gold ring with a ruby is often not recommended, you would have to agree that, flanked with a number of diamonds, this design would certainly also look very beautiful. It would even be a daring, yet ultimately elegant, choice for an engagement ring. If you can’t find the gold ruby ring you were looking for in our collection, you also have the option of contacting our experts for a tailor-made solution. 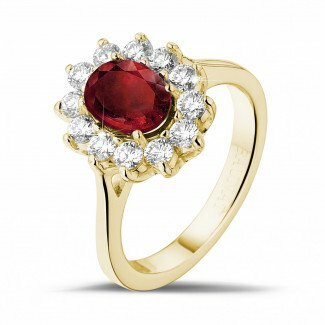 Would you like some guidance with choosing the perfect gold ruby ring? Contact BAUNAT’s experts via phone, email or chat. You are also welcome to visit one of our showrooms by prior appointment.